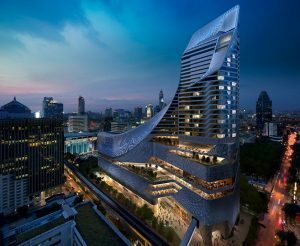 Bangkok (Thailand)- May 12, 2017 (travelindex.com) – After some delays, Thailand is finally got its first Park Hyatt Hotel. The luxury hotel brand of the Hyatt Group will opened its doors on May 12. The hotel occupies the top 20 or so floors of Central Embassy, a luxury shopping mall in Bangkok. Embracing its enviable location in the world’s most popular tourist destination (according to the MasterCard Global Destination Cities Index 2016), Park Hyatt Bangkok promises to offer a refined and uniquely Thai experience, reflecting the country’s rich culture and legendary warm and gracious hospitality. A devoted team of hosts dedicates themselves to providing Park Hyatt’s world-class discreet and sincere level of service. Park Hyatt is competing in the high-end five-star market, which includes the 140-year-old Mandarin Oriental and The Peninsula both located on the banks of the Chao Phraya River as well as with the Plaza Athénée Bangkok on Wireless Road and the Sukhothai on Sathorn. Intimate and residential in style, Park Hyatt hotels promise gracious service on a personal scale. Located in many of the world’s premier destinations, each Park Hyatt hotel combines elegance with distinctive regional character. Park Hyatt hotels feature sophisticated interiors, meeting and special event spaces for small groups and social occasions, critically acclaimed art programs, and signature restaurants featuring award-winning chefs. Hyatt Hotels Corporation, headquartered in Chicago, is a leading global hospitality company with a proud heritage of making guests feel more than welcome. Thousands of members of the Hyatt family strive to make a difference in the lives of the guests they encounter every day by providing authentic hospitality. The Company’s subsidiaries manage, franchise, own and develop hotels and resorts under the Hyatt®, Park Hyatt®, Andaz®, Grand Hyatt®, Hyatt Regency® and Hyatt Place®.